Every year Laphroaig releases something special for the members of its affinity program “Friends of Laphroaig” under the moniker Cairdeas (which is Scottish Gaelic for friendship). Sometimes these releases can be quite hard to come by, and we’re told that the supply for the 2014 Laphroaig Cairdeas Amontillado Edition is much smaller than last year’s Port Wood Edition. For the 2014 Cairdeas release, Laphroaig’s Master Distiller John Campbell uses an uncommon finishing barrel, Amontillado sherry. Amontillado is a drier style of sherry than Oloroso (which is the most commonly used sherry barrel for whisky) and it brings salinity, citrus, and a nuttiness to the equation. Unlike many of the non-age stated releases on the market, Laphroaig has been completely forthcoming about the age of this year’s Cairdeas malt: it’s an 8 year old single malt which spent 7 years in ex-bourbon barrels before spending a year in Amontillado sherry hogshead casks. 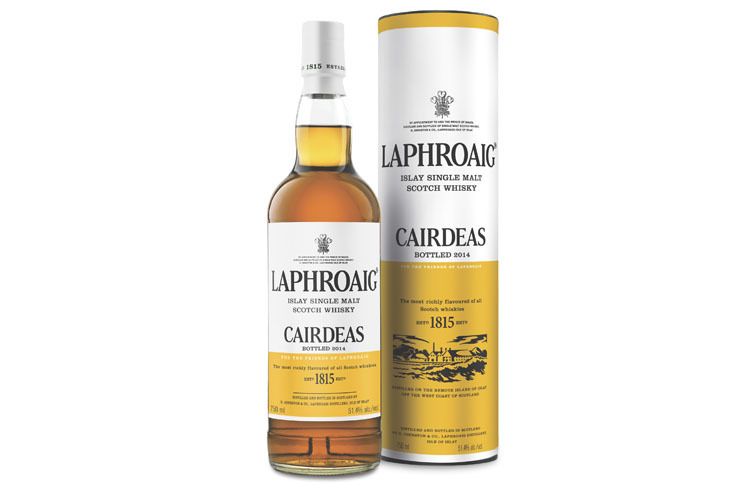 Laphroaig Cairdeas 2014 Amontillado Edition (51.4% ABV / 102.8 Proof, $74.99) – golden orange in color, the nose of this year’s Cairdeas leads with Laphroaig’s signature ashy campfire peat smoke, which is balanced by lemon peel, salt, almond, and iris. In addition to its campfire qualities, the peat in the Amontillado edition also has a slight rubbery note to it. Laphroaig Cairdeas 2014 is flavorful right out of the gate with ashy peat smoke combining with salt, honeysuckle, almond, and lemon peel. While there’s a hint of honey sweetness, the opening is fairly dry. The ashy campfire peat smoke introduced in the entry ramps up fairly quickly towards the midpalate where it’s met with some solid spice including black pepper, leather, clove, and oak. The level of salinity also increases into the midpalate. Surprisingly, the dry citrus, floral, and subtle sweet notes from the opening manage to balance out the intense smoke and spice. It’s a delicate balance, but somehow it works. Towards the end of the midpalate, the smoke and spice notes come to a crescendo with the addition of some heat from the spirit. 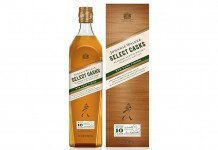 It’s really here that we really get any sense of the proof of this whisky. Up till this point, you’d be hard pressed to pick this out as 51.4%. The finish for Laphroaig Cairdeas is long, ashy, smokey, slightly acidic, and dry. There’s a lot to really respect about this year’s Laphroaig Cairdeas release – not only has Laphroaig disclosed the actual age of this release (8 years), they’ve kept the price consistent with the previous year’s release. When you compare the Laphroaig Cairdeas release at $75 to the recent Ardbeg Committee Supernova Release at $180, you realize that Laphroaig is trying to reward its loyal fans, not fleece them. Laphroaig Cairdeas 2014 Amontillado Edition isn’t the out of the park home run that last year’s Port Wood Edition was, but it’s a very well crafted exploration of Laphroaig’s core ashy peat. 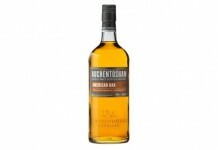 The Amontillado brings some interesting things to the equation, and for Laphroaig fans who love its signature ashy peat, this will be quite a treat. 90 Points. Laphroaig Cairdeas 2014 Amontillado Edition isn't the out of the park home run that last year's Port Wood Edition was, but it's a very well crafted exploration of Laphroaig's core ashy peat. The Amontillado brings some interesting things to the equation, and for Laphroaig fans who love its signature ashy peat, this will be quite a treat.